This photo of Joe King was a gift to Barbara Moser from the King himself. We have lost our Joe King and we will miss him. Joe was the associate editor of The Senior Times in the late ’80s and early ’90s and a talented and comical addition to our staff. Joe was always … you guessed it … jo(e)king. He died October 26 at the age of 90. 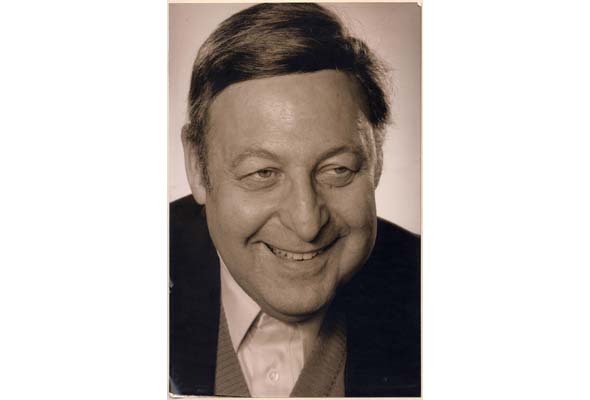 Before writing books about the history of Montreal Jewry, he was a radio man, which explains the one-liners and the way he wrote for us—to the point, and always with a touch of humour. “I cannot help but acclaim those brilliant people who are setting up a garbage museum in the U.S. Why do we always have to wait for the Americans to set the pace? In any event, this Museum of Garbage is to be erected at an appropriate site in New Jersey. From what I have seen of New Jersey, they should have no problem finding a site for a garbage museum. The problem will be clearly identifying the museum from the other sites. “Great care should be shown in selecting what goes into the garbage museum. There is so much garbage in the world. Much of it goes unclassified. First you have those slick, expensive government reports that are pumped out in astronomical numbers. It was Joe’s idea for The Senior Times to publish a resource directory, which he researched extensively and contributed to. We now publish a French and English directory annually. A devoted and constant advocate for Israel, Joe served as president of Canadian Friends of Tel Aviv University and Canadian Friends of Haifa University. Joe is the author of several books on Israel and the Montreal Jewish community and was known for his thorough research on its leading lights and their achievements. Joe’s other contributions include From the Ghetto to the Main, Baron Byng to Bagels, The Jewish Contribution to the Modern World and The Case for Israel as a handbook and DVD. Joe was our chronicler, archivist and storyteller. I will miss seeing Joe on his walks or on the bus going to a meeting or to the library. Our deepest sympathies to Joe’s family. Be the first to comment on "Appreciation: The ST’s King of the one-liners will be missed"